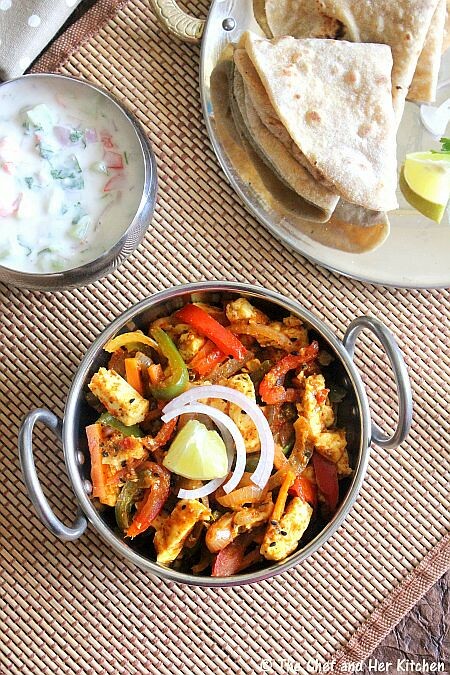 I have recently posted a simple paneer sabzi in my blog which is quite easy to make and tastes delicious too.Today's version is similar to my simple paneer sabzi recipe which I posted earlier.Ever since I have found this recipe in Nita Mehta's cook book,I have been preparing Paneer Jalfrezi recipe.I have avoided few ingredients and added few more ingredients to the original recipe to suit our taste buds. 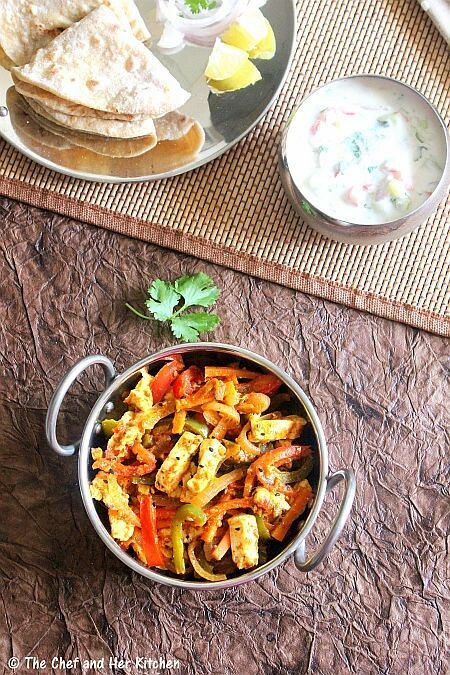 These kind of dry paneer sabzis like my simple paneer sabzi, paneer bhurji, paneer jalfrezi and kadai paneer make excellent fillings for frankies or sandwiches(like foot longs).Hence, I always make more quantity of these sabzis so that I can use them for my next day morning's breakfast in the form of rolls.I can say it serves the dual purpose - TWO-in-ONE Recipe.The list of ingredients looks long but all the ingredients are easily available in any Indian pantry,so go ahead and try this to treat your family. Cut all the vegetables uniformly into 1" thin strips.Remove the pulp of tomato and cut into thin strips. Puree the other tomato with the pulp of tomato(which was cut into strips). Heat oil in a kadai/pan and add cumin seeds and nigella seeds and let them splutter. Add julienne onions and fry until they turn pink and then add ginger-garlic paste and fry well for a minute. Add tomato puree, tomato ketchup, turmeric powder, red chili powder, coriander powder, amchur powder, garam masala, kasuri methi and salt. Fry them until the mixture is slightly dry. 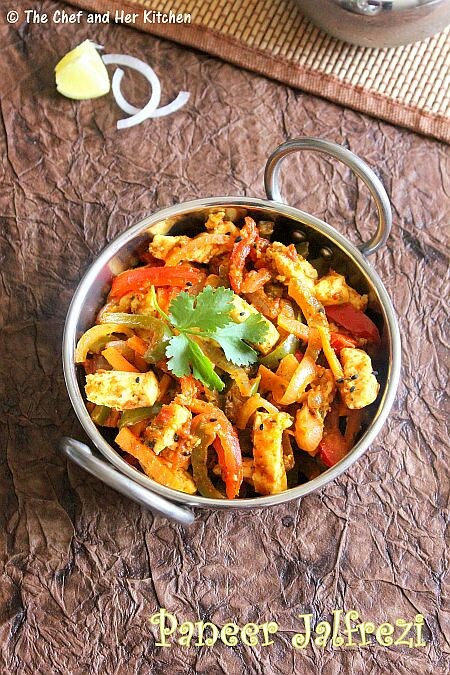 Add the colored bell peppers,capsicum and fry again on high flame for 2 mins. 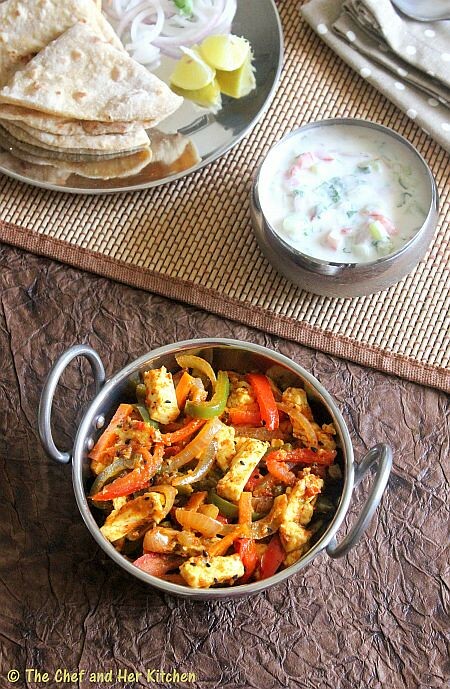 Add tomato strips(seeded and cut) and paneer strips and gently mix them until all the masalas coat all the vegetables and paneer.Continue cooking for 2-3 mins. 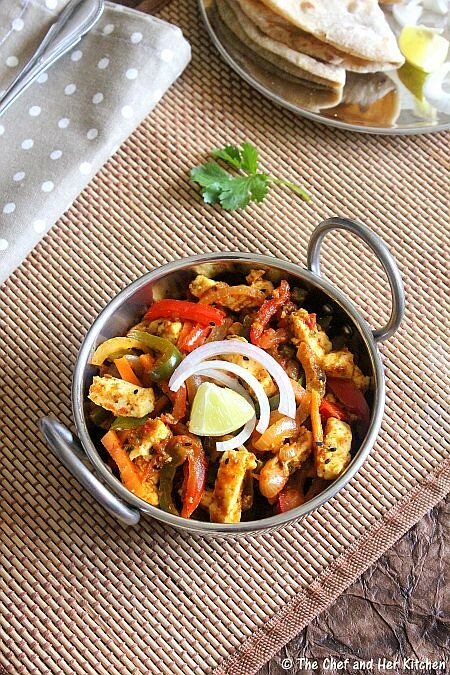 Serve it hot with roti/paratha/pulaos. Stuff it in a thick chapathi and eat as a kathi roll or you can even stuff it in a sandwiches or foot longs. If you want to make a kathi roll out of it spread this curry in the center of thick chapathi lengthwise and top it with julienne onions and sprinkle chaat masala generously,salt and pepper and a dash of tomato ketchup and roll it and serve immediately. For foot longs apply tomato ketchup and then spread this curry and top it with julienne onions and serve. For a normal sandwich,stuff in between two butter ladened bread slices and toast it in toaster or on a pan and serve it with ketchup. 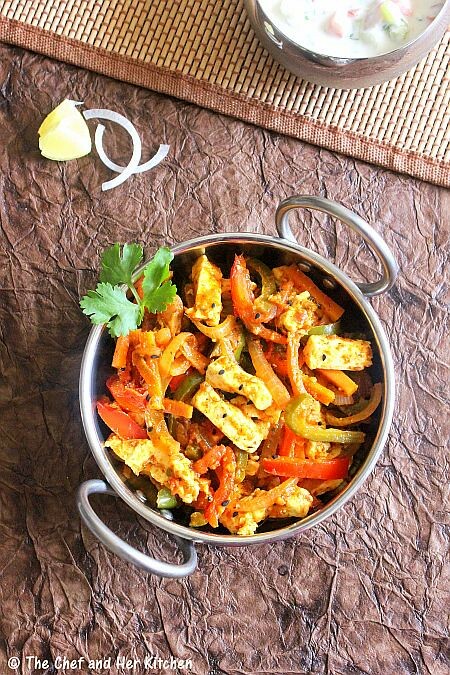 If your paneer is slightly hard,immerse them in warm water until its usage which will make it soft. You can avoid carrots in the recipe if you do not like them. Do not miss nigella seeds,kasuri methi and tomato ketchup in the recipe.As these three ingredients makes this curry taste different from the usual ones. Her version had mustard seeds,fenugreek seeds and curry leaves in the seasoning.I avoided mustard seeds and curry leaves as I don't like the mustard seeds and curry leaves popping over those pretty paneer pieces.I replaced fenugreek seeds by kasuri methi which works great for this curry. I do not like much of carrots in this recipe,hence I added only one.If you want you can add more carrots in the curry as the original recipe said. Looks super yumm.. 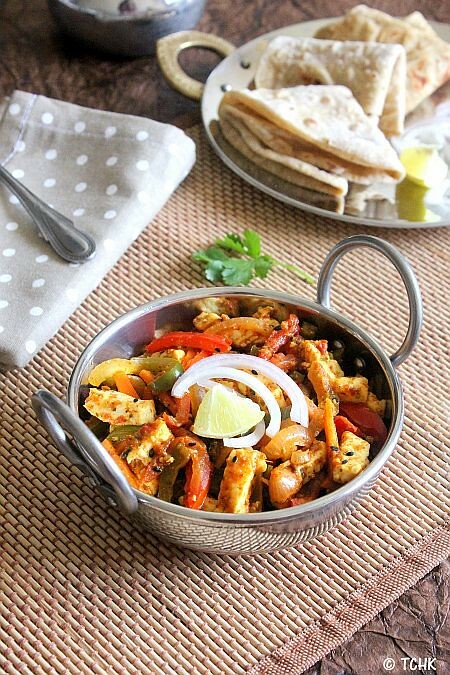 I make this too..have the sanjeev kapoor recipe at my space..
Paneer jalfrezi looks spicy and yummy. one of India's most fav. and quickest dish I guess. you nailed the recipe and made it perfectly. I dont mind finishing that whole kadai,love it. absolutely agree with you about the 2-in-1 usage. very smart thing to do with the leftovers or excess. Omitting mustard is a good idea, ksuri mehti sure takes the dish to a different level, and looks so colourful and healthy, going to try this week.